The aloes are a large group of shrub- or tree-like succulent perennials that typically grow in arid regions. Many of the species occur in various countries in southern and eastern Africa. Others can be found on the Arabian Peninsula (in Oman, Saudi Arabia and Yemen), and on the islands of Madagascar, Mauritius, Seychelles, Reunion, Comoros, and Socotra. Most of these species have small distribution ranges, but a few, such as A. arborescens and A. maculata, are widespread. 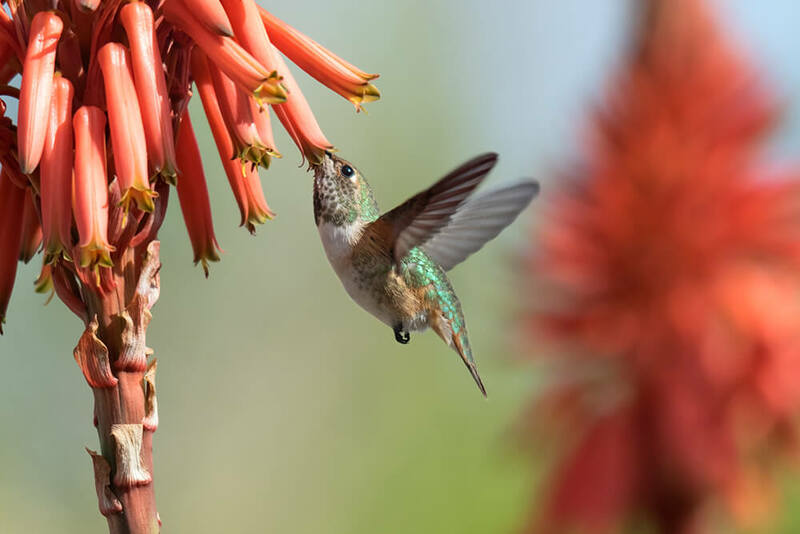 Depending on the species, aloes are pollinated by various birds and insects. Many other species of insects, birds, and mammals are pollen or nectar "thieves," that feast on these plant products without contributing to pollination, and in some cases even consume entire flowers before they set seed. In some hot, arid places, aloes are a keystone species, being among the few perennial plants. For example, the quiver tree A. pillansii provides a vantage point for birds of prey and nesting sites for other birds, and although its sharp leaves and bitter leaf sap keep some herbivores away, it provides food for many animals, too. Aloes resist drought by storing water in their large, fleshy leaves. The gray-green to bright green leaves are thick, rigid, and pointed at the tips, often with toothed margins. In some species, leaves grow straight out from the center; in other species, they curve upward, and in still others, they curve down toward the ground. Densely clustered, tubular, bright red to yellow flowers grow on stalks high above the leaves. Small fruits develop from fertilized flowers, and when the fruits dry out, they form pods that split open to release tiny seeds. Small, papery wings on a seed help it disperse in the wind. Aloes often grow in dramatic shapes. Many are low-growing rosettes of thick, fleshy leaves that appear to be stemless. Other species are single-trunked, unbranched tree aloes or immense, branching tree aloes. Still other species are miniature forms. Some species of unbranched tree aloes, such as A. excels, A. ferox, and A. marlothii, can be as tall as 18 feet (5.5 meters) or more. As they grow, they retain their dead leaves, which form a skirt about the tall trunk. In contrast, the branching tree aloes, such as the giant tree aloe A. barberae and quiver tree aloes such as A. dichotoma, drop their dead leaves to expose a thick grayish trunk that expands in circumference as the plant grows. These branching tree aloes sometimes reach heights of 30 feet (9 meters). With their bright flowers, dramatic shapes, and ability to withstand low-water conditions, aloes are beautiful and popular ornamental plants in containers and in gardens. Aloes also have a long history of use in medicines and cosmetics. A. vera, in particular, is hailed for its healing properties. The translucent, gelatinous, inner pulp of its leaves is an ingredient in some soaps, shampoos, and moisturizers, and for the treatment of sunburn, other minor burns, and abrasions. Aloes sometimes create natural hedges and boundary fences, and in rural areas, the prickly plants are sometimes grown to create animal enclosures. Most aloes have restricted ranges and small populations, which makes them particularly susceptible to habitat loss as land is converted for livestock grazing, farming, or human habitation. Another threat is the collection of young aloes for the horticulture trade. Many aloe species inhabit extremely hot and dry areas, and global climate change poses a very real threat to their survival. CITES lists 21 species of aloes on Appendix I: 17 are species endemic to Madagascar, and 4 are species that occur in just 1 or 2 countries of southern Africa. With the exception of A. vera (which has naturalized in many areas), all other species are listed on CITES Appendix II. IUCN lists 56 aloe species as Vulnerable, Endangered, or Critically Endangered. Aloes can be grown from seed or propagated from cuttings or pups (suckers). Some species, notably A. vera, are commercial crops. Specimens of mountain aloe A. marlothii may live for 100 years or more. Many aloe species are adapted to withstand fire. Even when fire destroys the above-ground part of the plant, below ground the roots survive—and the plant re-sprouts. In some areas, aloes are eaten in pickles, preserves, and jams. The tallest aloes reach heights of 30 feet (9 meters) or more. Blooming aloes bring a bright spot of color to Southern California in winter.